Ingredients: Refined wheat flour, Ripe Banana, Vegetable Oil, Turmeric, Sugar, Salt. Peel the ripe banana and trim both the ends then sliced into pieces in length wise. Make a batter with refined wheat flour, salt, cumin and water. 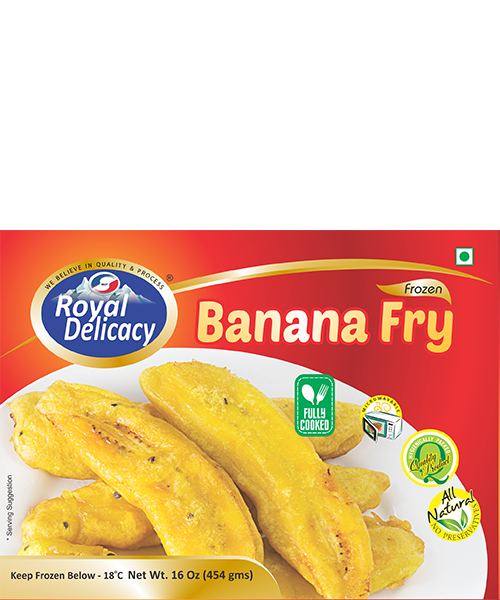 Dip the banana in batter, Deep fry the banana in hot vegetable oil until they become golden yellow. Then pre-cool the product before blast freeze at -32 °C and pack and stored at – 18 °C. The procedure is carried out so as to assure that the product is free from any type of contamination.